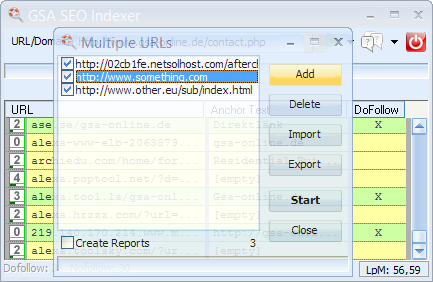 You can not sit there watch the tool getting finished and enter a nother URL in case you have a large list of URLs you want to get indexed. So you just click the down arrow next to the START button and choose “Multiple URLs”. On that dialog you can Import, Delete or Add new URLs and later hit the Start button to get them all proceed. You might consider not let it create reports for each submission as it doesn't have to wait for the current URL to get finished.